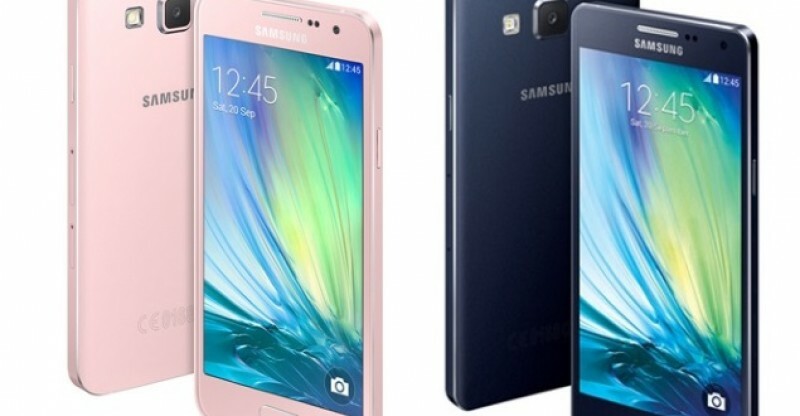 The new versions of the Galaxy ‘A’ series, Samsung Galaxy A3 and A5 Leaked in Images, Developed under the code names Galaxy A3 (SM-A310) and A5 (SM-A510), Both Handsets looks reminiscent to the Galaxy Note 5. Design similar to their flagship siblings, Samsung uses an aluminium frame and a removable plastic back. Like the four high-end models launched by the Korean company this year, New versions of Samsung Galaxy A3 and A5 will include a 4.7-inch with HD resolution (720p) screen and a 5.2-inch screen with full HD resoution (1080p). Screens which, like last year, Display comes with based on technology super AMOLED . With fine plastic boundaries, and the style of the back camera (with an LED flash). Galaxy A3 comes with an internal memory of 16 GB, expandable via MicroSD and battery of 1900 mAh (non-removable). Powered by an Exynos 7580 quad-core processor, with a 64-bit processor clocked at 1.2 GHz coupled with 1.5GB / 2GB RAM and the device compatible with 4G / LTE Cat 4 (Speed support up to 150 Mbit / s). Galaxy A5 powered by octa-core Samsung Exynos 7 processor clocked at 1.6GHz, Coupled with 2 GB RAM. At the level of the battery, it will include a 2300 mAh (non-removable). According to the previous leak, Galaxy A5 will run with the operating system of Android 5.1.1 Lollipop. Coming to the camera side, Both Samsung Galaxy A3 and A5, comes with rear camera on 13MP camera, LED flash, For photos and video chat, It has designed with 5MP snapper in the front. You can capable of record videos in Full HD. Samsung also plans to launch another model of ‘A’ series Galaxy A7, it features an octa-core Samsung Exynos 7 processor, 64-bit processor (two groups of four cores), 2GB RAM and 4G support / LTE Cat 4, Galaxy A7 features a Super AMOLED 5.5 inch screen with resolution of 1080 x 1920, And rear camera of 13 megapixels and 5 megapixels front camera for video chat, an internal memory supports up to 16 GB expandable via MicroSD and a battery 2600 mAh (non-removable). And this device Leaked to run Android 5.1.1 Lollipop.